A Soxhlet extractor is a kind of laboratory equipment. It is made of glass. Franz von Soxhlet invented it in 1879. It has a flask, an extraction chamber, and a condenser. It can be used for solid-liquid extractions. In this discontinuous extraction process, the extraction solvent inside the boiling flask is evaporated and re-condensed in the distillation column above. It then falls down onto the solid material requiring extraction. 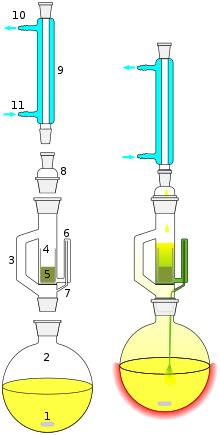 The chamber containing the solid material is connected to the boiling flask below by a syphoning mechanism seen in the Pythagorean cup, which allows the chamber to fill to a point, at which it will empty its contents and start to fill again and the extracted compounds will accumulate in the boiling flask below. Chemists use it to remove a material from a solid. It is useful when removing materials that do not dissolve well in any solvent. Chemists use a solvent such as ether or alcohol in the extractor. The Soxhlet extractor applies the solvent repeatedly to the solid until enough of the material dissolves. This page was last changed on 16 July 2018, at 08:25.